Free flow edit works similar to the MSG feature but while each MSG is limited to 3 lines, this new feature is free-flow. Some other differences are that EST is case sensitive and will accept letters in lower and upper case. Spacing is also maintained so that lists or amounts can be placed wherever desired. 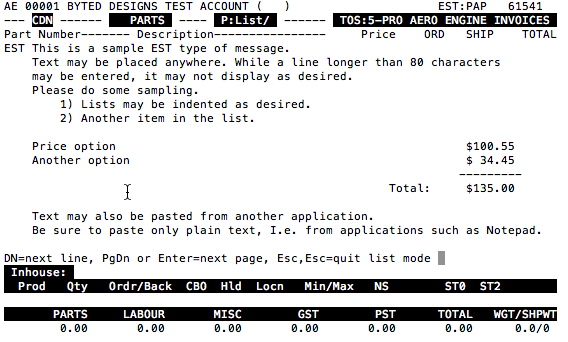 To invoke use EST at the part number prompt instead of MSG. To edit or delete an existing paragraph use E/ or D/. To load a paragraph from a file use EST? If you selected to import from a file with EST? you will be able to select the file and the contents will be loaded into the paragraph, otherwise you will be presented a blank paragraph. Place your text anywhere you like. 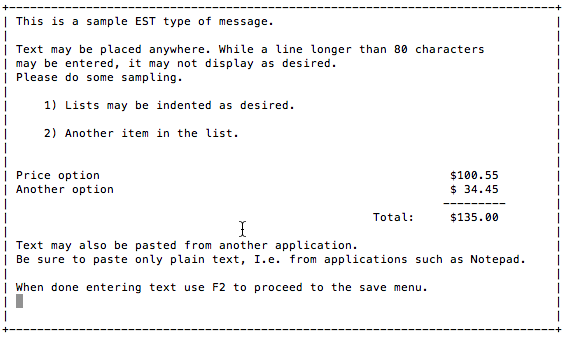 When done with adding/modifying text, use F2 or ESC,ESC to exit/save the paragraph. Use A – to simply save you changes to the current pick/estimate. B – allows you to save a copy of the paragraph under a new name and will also save it to the current pick/estimate. C – abandons your changes and reverts back to the version prior to edit. If you save under a new name the filename dialog will appear. Please use only valid letters or numbers in the filename, avoiding spaces and special characters. If you also want to edit the paragraph/file outside Tracker, perhaps with Windows Notepad, be sure to add a filename extension of .txt to your filename. By default the paragraph files can be found outside of Tracker in your TrackerShare/wwp for Progressive Air and TrackerShare/aero/wwp or TrackerShare/asport/wwp. Optionally Tracker can be configured to save all paragraph files in a single folder, like TrackerShare/wwp. Depending on your workstation capability, you can also paste text into a paragraph. Use Text Only, as the paragraph does not handle any graphics. Some caveats…. The first line is used to identify the paragraph in E/ (Edit) and D/ (Delete) dialogs so blank lines should be avoided to make it easier to identify if multiple EST’s are in use. Once a paragraph has been edited, it will always be moved to the end of the pick/quote. Multiple EST’s can be used but keep in mind that their order may be disturbed if any EST has undergone an edit. Some characters are reserved in Tracker, used for formatting text. If you are missing printed output for characters such as % or @ please use 2 of them, I.e. %%. They are not always reserved so the trial and error method applies. The paragraph import or cut’n paste will split lines that are longer than printing can accommodate. These splits may occur at text you may not want to split at that point. For that reason it is recommended that you format the text correctly to fit before importing or using cut’n paste. Corrections for these issues are currently being worked on.